We are a family-run business that has been successfully serving home-made Brazilian and Portuguese food in the heart of the Ironbound for the past 6 years. Our unique location has been home to several different Portuguese restaurants for the past 30 years and once my family, being from Sao Paulo Brazil took over, the fact we now had a large Portuguese clientele just could not be overlooked. Having this in mind and in our hearts we decided to keep many of the traditional Portuguese dishes in our menu and added many Brazilian ones as well. The interplay of not only the two cuisines but the two cultures have mashed together wonderfully not only in our menu, but in the wonderful people that come to us to enjoy a great meal. So come on in and enjoy the Ironbound’s most traditional cooking, it might just take you to a small city in Brazil or a neighborhood in Portugal… That’s what the locals tell us! What does Sabor Unido mean? 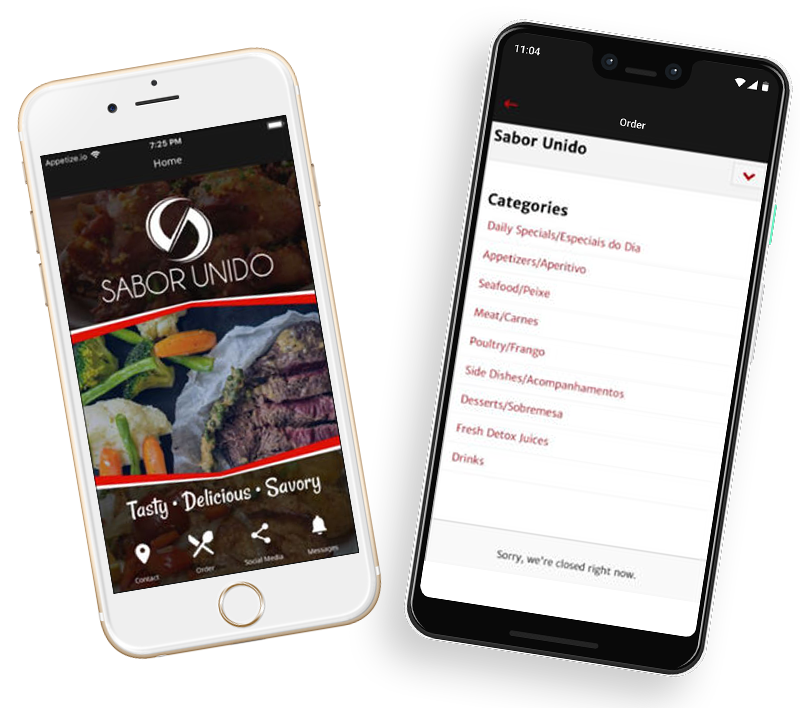 Sabor Unido translates to “United Flavor”. We decided to give our restaurant this name based on the rich culinary of both Brazil and Portugal. The Ironbound in Newark is a melting pot of the two cultures and we brought them together under one roof. Normally we suggest finding parking on the street outside the restaurant. But if you’d like there is a parking deck located just a block up from us. Just cross the light and it’s your first left on Jefferson St, Saint James Parking Garage – $ 3 per hour. Sabor is owned and operated by Orlando, his wife and Chef Silvana, and son Luiz. What days do you have live music? Every Saturday we have Bossa Nova, a style of Brazilian music popularized in the 1950s and 1960s that involves Brazilian Samba and American Jazz. From 6-9pm. Reservations strongly recommended! All major credit cards are accepted, including apple pay. Reservations are usually not needed on weekdays. But on the weekend we strongly recommend making reservations as we get very busy. Once your reservation is placed on the website, you MUST receive a confirmation text. Otherwise your reservation is void. Yes, we have many different sides you can pick for your entrees, and a vegetarian dish constitutes three sides. Also ask the owner Orlando, a 20 year vegetarian, if he has any recommendations! Who is the chef at Sabor Unido? The kitchen is run by both Silvana Campos and Miguel Palma. Silvana brings a rich and extensive culinary experience from Brazil, having lived and tasted different cuisines from all regions of Brazil. Miguel is originally from Guatemala and is trained in the Portuguese cuisine. Yes, you can bring your own bottle of wine or beer. There is no corkage fee and there is a Liquor Store conveniently located across the street. How far are you from NJPAC/Prudential Center? We are a convenient 5 Minute drive to Prudential and NJPAC, respectively. That translates roughly to a 10 to 15-minute walk along the main street in the Ironbound. Family-run, BYOB nook offering homemade Brazilian & Portuguese comfort food in warm, laid-back digs.